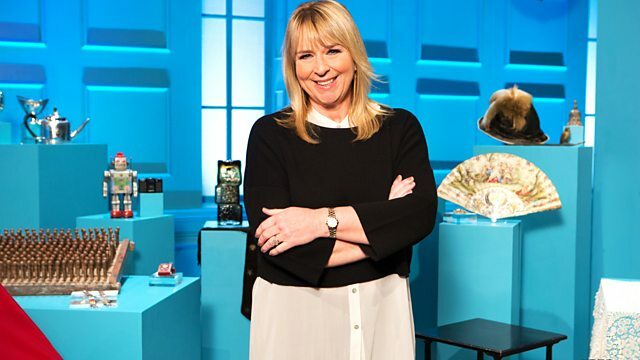 Antiques quiz show hosted by Fern Britton. Antiques expert Charles Hanson assists Fern as the three teams compete for the prize. and tempts you with antiques. to choose an antique or collectible and build a collection. it's to amass the most valuable collection. and one person who has both in abundance is our resident expert. -It's the wonderful Charles Hanson. -Oh, I say. Oh, don't! Hello. -Charles, lovely to see you. Please tell us about the lots we're playing for today. Mm-hm. Interesting and eclectic, yes. of one of the items in their collection. Team One, welcome. Who are you? and I'm teamed today with my husband Mark. We are avid antique collectors from Porthcawl in South Wales. Welcome and good luck. Team Two, who are you? Oh, hello, Fern. My name's Rhiannon and this is my friend Lisa. and have been really good friends ever since. Good luck and welcome. Team Three, who are you? Hi, Fern. My name's Michelle and this is my husband Alan. and we started our relationship by flirting in the cafeteria. Well, there's no better place to flirt than a police cafeteria. Welcome, everybody, and jolly good luck. but could they separate the high-end from the high street? Wow, what a lovely room. This is interesting. Pick that up and have a look at the base. Handle with care. Hold on, handle with care. -These seem to go quite well, don't they? -I think it looks Indian. -Why is it Arabic? That's an interesting word. The inlay is suffering, isn't it? -I'm drawn to the design of that. -I don't know much about that sort of thing. What about you? But this is a collectible area, isn't it? -Do you think it's worth a bit? -It will be to the right collector. -Have you seen something like that? With a box, you're quite right. We like a completeness. Well, I don't know much for this one. Any marks on the back? Well, it's metal, isn't it? Somebody's taken that out and they've actually hand-painted it. So, you think it's a second? It's a blank? The medal. Something we know very little about. What's the writing on the side there? "Battalion of The Grenadier Guards." There won't be many of those about, that's for sure. OK, let's have a look at the candlesticks. I don't think it's a hallmark. -Some kind of a woodworking measuring tool, isn't it? It looks like some sort of draughtsman's tool, doesn't it? Some tools, Michelle, can be worth a small fortune. Goodness me, the salt cellar. That's very unusual, isn't it? That would go well in the cottage, that would. I wouldn't say that's of any great value, though. -That looks really old. Is it Roman? I wonder how long that'd been in the ground. It looks...old, to say the least. No, you can't have it. It's theirs. So, look at that. That is absolutely amazing. They say small is beautiful, but is it the most valuable? They look very 1960s, don't they? Top lot, I would say the carriage. Bottom lot, the salt cellar. Top one, vinaigrette. Bottom one, the tool. I think top item, medal. Bottom item, tool. Yeah, OK, job done. I'm happy with that. So, you were spying on them, Charles. I really enjoyed it, Fern. It was wonderful to watch. And how do you come to the valuation of these objects? but with no auction costs added. So, when I say, "Sold," that's the price they would fetch. OK, and just to add an extra twist, we have our mystery lot. So, for now, it's time for Round 1.
you would like to play for. you will get to add that to your collection. you'll be frozen out of the next question, OK? Here we go then, quizzers. Fingers on buzzers. Question number one. It is a tortilla. The plant pot is yours. Mark and Amanda sticking with the coach set. Lisa and Rhiannon have now gone for the medal. Alan and Michelle sticking with the vinaigrette. Fingers on buzzers. Question two. between the Soviet Union and the West? It is the Cold War. The vinaigrette's yours. -Well done. Michelle's pleased with that. Lisa and Rhiannon, the poster. It was Moses. The medal is yours. Mark and Amanda, the coach set. Alan and Michelle, the earrings. Quizzers, fingers on buzzers. Question four. was the debut album by which Sheffield band? It was the Arctic Monkeys. In 2015, Malcolm Turnbull became prime minister of which country? -The earrings are in your collection. Alan and Michelle, the candlesticks. Quizzers, here comes question six. which character had a sidekick called Muttley? -That coach set is finally yours. It's just drawing up now in your collection. Very good. Mark and Amanda have gone for the poster. Lisa and Rhiannon staying with the poster. Alan and Michelle sticking with the candlesticks. Which British comedian is famous for his Pub Landlord alter...? Yes, his Pub Landlord alter ego is Al Murray. Congratulations, Mark. The poster is yours. There's no stopping him now. Look at that. Here we go. Final question. Pickers, make a pick. Mark and Amanda, the candlesticks. Lisa and Rhiannon, the coin. Quizzers, this is your final question in this round. Which word is both a man's name and a woman's short hairstyle? Bob it is. The coin is yours. let's have a look at what you have in your collections. Mark and Amanda, you have the coach set and the poster. Lisa and Rhiannon, you have the plant pot and the coin. the earrings and the medal. So, Team One, we're going to start with you. First of all, I want to know a bit more about you. So, Mark, you're a pretty good quizzer, aren't you? and answer the local pub quizzes. so it can really depend on the questions. -If you know it, it's easy, isn't it? And, Amanda, you've taught Mark, he says, a lot about antiques. taking me around fairs and auctions and boot sales. because he had no interest prior to that. Welcome, both of you. It's lovely to have you here. I'd like to know a little bit more about the coach and horses, please. It's really caught your eye, hasn't it? entitled Her Majesty's Stage Coach. in Britain around the 1950s, so mid-20th century. of that King George III in 1761. Overall, it's in good condition. It comes with its original box - always a bonus for buyers. so, what do you think, Amanda, it's worth? Hmm. Don't say anything. Just let you think about that. Lisa and Rhiannon, how did you two meet? when we were both pregnant with our eldest sons. she just got up and walked out cos she was bored. and no-one was very relaxed after that. We went for a coffee and the rest is history. How lovely. You thought, "Yeah, she's for me. "She's not paying any attention." OK, Rhiannon, tell me, what do you collect? I like glass and I like sort of mid-century design. Mid-century meaning 1950s or something? Yes, something like that poster, I think. Ah! Ooh, you may have let something out there you shouldn't. Yes, but it's very nice to have you here. Good luck, girls. So, what lot would you like to know more about from Charles? Oh, I'd like to know more about the plate, please. that seem to provoke conflicting reactions from people. so it is a later example. This particular plate has a provenance, Rhiannon. -to pay for a new roof at Althorp House. -That's an intriguing story, isn't it? Well, good luck, Team Two. let's find out a little bit more about you as well. So, Alan, I understand you like to collect fossils, stuff like that. and that's full of really old - and I mean really old - fossils. Yes, and what about you, Michelle? Do you have collections at home? because we'd got so much of it, we hadn't got any room. Well, incredible. Lovely to have you here. I'd like to know more about the earrings. which are made of a rose, yellow and a white gold. and bear the signature of Marina B. But what does the B stand for, you might ask? Well, I can tell you it's Boulgaris. the founder of the highly regarded jewellers Bulgari. So, there is a real pedigree. wanting a bit of vintage flair. Thank you, Charles. Intriguing information. -I hope that's helped a bit. It's time to play Round 2.
either on The Tudors or Autobiographies. OK, Team One, you are up first. So, Amanda, tell me what your lot is. -I'd like the plate, please, Fern. OK, Physics or The Olympics, Mark? -The Olympics. Here you go. A foil is a piece of equipment used in which Olympic sport? Correct. The plate is yours. You've made that look very simple. Rhiannon, would you like to choose something? Lisa, UK Geography or The Olympics? -I'll go for The Olympics as well, please. What do the initials IOC stand for? Yes. The salt cellar is yours. Michelle and Alan, your turn. Michelle, what would you like? -I'm going to go for the candlesticks. UK Geography or The Tudors, Alan? By population, which is the second-largest city in the UK? It is. Birmingham is correct. or you can steal from someone else's collection. OK, Team One, do you want to pick from the grid or steal? I'd like to pick the table, please. The table on the grid? OK.
UK Geography or Action Films, Mark? In which English county are the White Cliffs of Dover? It is Kent. The table is yours. Lisa and Rhiannon, pick or steal? I'd like to steal the poster, please. Steal the poster from Mark and Amanda. Mark and Amanda, you can talk amongst yourselves. Which question category would you like to give Lisa? I would either say Physics or Action Films. -Yeah, we'll pick Physics, Fern. to the centre of the Earth? Yes, easy. The poster is yours. Alan and Michelle, pick or steal? The plate. Poor Mark and Amanda! -Oh, they're ganging up here. Right, Mark and Amanda, give me a category for Alan. Well, nothing to do with his style, but Fashion. for the four major biannual fashion weeks? -It is not Tokyo. It's Milan. The plate is not coming to you. Well defended. Mark and Amanda, what would you like to do, pick or steal? I'd like to steal the vinaigrette, please. The vinaigrette, which is with Alan and Michelle. What category are you going to give Mark? Autobiographies. Mark, here's your question. of which businessman and media personality? You've got the vinaigrette in your collection. what category would you like to give Lisa? Lisa, which Winter Olympic sport is played with stones and brooms? Curling it is. The medal is on its way to you. Sorry, Alan and Michelle, but here's your chance. -I think we'll steal the plate. The plate in Mark and Amanda's collection. Right, Mark and Amanda, please give me a category for Alan. Fashion again! Kick a man when he's down. where it was first worn? I would imagine that's tuxedo. the vinaigrette and the table. the poster and the medal. the plate and the candlesticks. OK, for one team, it is now the end of the road. So, Charles, who is leaving us first? is actually the pair who I thought might be favourites. -I'm sorry. Round of applause. you want to know the value of your collection. Shall we go through them piece by piece before we come to the total? It was the stagecoach, Amanda, that you really wanted to acquire. You were quite pleased it had the box with it. That was quite key. Wonderful little toy. Its auction value was £200, OK? So, not a huge amount. And you also had the table in your collection. which is typical to Syrian furniture. Just look at it. It's quite wonderful. and then the mother of pearl was inlaid on top. It's a super item. It's full of eastern promise. For what it's worth, it was £250. And then finally, that engraved, Victorian, silver vinaigrette. as far back as Regency times - around 1800.
it's covered in this really pretty, attractive, engraved design. but its value - £60 - seems quite cheap. Your final total of your three items was £510. Well, you did very well, but not well enough. Mark and Amanda, thank you so much for playing For What It's Worth. what they are worth and if the top lot is still in the game. They've virtually cleaned us out today, haven't they, Charles? used by joiners and carpenters, especially in the shipyard. of course, value would be huge. But I can tell you, quite simply, it's virtually worthless. So, which lot do you need to know more about, Lisa and Rhiannon? I'd like to know more about the poster, please. Here we have a promotional airline poster from the late 1930s. and superstructure for the QE2. are one of the largest collecting fields. but the really desirable examples have to be in perfect condition. and is only showing a little of its 80-or-so years of age. But will it make your collection take off? -as if it was made yesterday. It's so modern. Right, Team Three, what would you like to know more about? -I'd like to know a little bit more about the medal, please. to be awarded to every participant. who led Britain to that celebrated victory over Napoleon. It is a pretty rare piece. and this one has fared quite well. So, is it an item worth battling for? It's all good, isn't it, and mysterious? and at the end of it, we will have our winners. Nine are correct, three are not. that you think is correct. So, Charles, who is that at the moment? -..Lisa and Rhiannon. Well done. in the geographical region known as the Caribbean. Would you like to play first or second? -First? OK, here we go. Nine of those are correct, three of them are not. Lisa, give me an answer. If it goes green, it's correct. Two islands in the shape of an exclamation mark. Well done. Alan, give me an answer. Yes, that's correct and the capital is Port-au-Prince. Home to the Caribbean's highest mountain. Correct. Twin island country, that one. Correct, also known as Spice Island. Yes, that's correct. Dominated by two volcanic spikes. Let's see all the other answers. -The Seychelles is an African country. San Marino is European, in Italy. It's Kim Kardashian and Kanye West's son. LAUGHTER Well done, Lisa and Rhiannon. That means you can steal a lot from your opponents. What would you like? -The plate, do you think? -I was thinking the earrings. Either/or. I'll leave it to you, picker. I'm going for the earrings. Alan and Michelle, this is for you. from the novel Watership Down by Richard Adams. -Yeah, OK. We'll go first. Give me an answer, Alan. Correct. A big, tough rabbit. Lisa. Yes, correct. A tough fighter. Correct. Dandelion because it was a yellow-furred rabbit. Petra is the Blue Peter dog. Pistachio, of course, a nut. -But it would have been a great name for a rabbit, wouldn't it? OK, Lisa and Rhiannon, get ready to steal. OK, the plate is yours. Third and final question now. Lisa and Rhiannon, this question is for you. Britney Spears UK Top Ten Hits. released by Britney Spears which have charted in the UK's top ten. OK, would you like to go first or second? -First? Let's have a look at the answers. Correct. Number one in 2004. Alan. and Underneath Your Clothes was Shakira. Everything else there, a Britney Spears top ten. Alan, I guess Britney Spears is maybe not up your street. -Pink Floyd, Led Zeppelin, yes. Girls, do it quickly, like ripping off a plaster. There we are. It's gone. Well, you have lost, actually, very nobly. Thank you for playing For What It's Worth. Well done, Lisa and Rhiannon. simple - is for you to claim your prize. So, which one do you want to choose? Discuss it with each other. This is really hard now. We've got too much to choose from, haven't we? Or the medal, or the coin that we know nothing about. -and I don't think it's the earrings. -Do you know the coin? Do you know anything about the coin? I think coin, medal or plate. I'm going to have to push you. Do you want to choose from those three? I want the poster. I'll go for the plate. So, you're going with the plate. Now, we need to let you know what you have said goodbye to. First of all, the salt cellar was up first. Rhiannon, you said, "Not my sort of thing." Lisa, you were quite intrigued by it. made of oak with metal bindings. It has a wooden handle. It's in great condition. OK? So, no huge sum. We then moved on to those pair of candlesticks. and stop them toppling over. from the very early years of the 20th century. You might call them Edwardian. Circa 1910. They are sterling, so they are 92.5% solid silver. and, of course, as ever, it's always good to have a pair. Their value? They're pretty good. -OK, then we have those earrings, which were so 1980s. that's that keyword in obtaining and adding value. And from the 1980s, we can move on to what really is quite jazzy. What have we got here? Well, it's Clarice Cliff. and important Art Deco designer of the 20th century. It's almost 900 years old. Remarkably, it's still fully round. but it's in very fine condition and is really quite pretty rare. They say small is beautiful and prized. Oh! That's a relief, it wasn't the top lot. OK.
hoping you would secure it, and you did. Well done. which folded in the year 1939. So, we know this poster is prewar. These posters are so, so desirable. Yes, there are a couple of crease marks in, but come on. It's been out of sunlight, it's so alive. ..you didn't take it on board because its value is £350. So, it comes down to two. This medal. What this is is a valuable campaign medal. Many have got lost over the years. Their values have jumped in the last 40 years. -I knew it. I knew it. and just out of interest, what do you think that might be worth? -No, we don't even like it. can we tempt you with the mystery lot? Lisa and Rhiannon, here is your lot. Charles is going to tempt you with today's mystery lot. -Charles, what have you got? It's an object of great beauty. There we go. -You're quite right on that note. If I take it out very, very carefully. -..which you might say is distressed. and it's safe to say it's not exactly in mint condition. without giving it some proper consideration. and opened it up like a book. and this has a very striking visual effect. and could produce a lovely noise once again with a little TLC. Hm. Right, your instant thoughts? and see if there's anything inside. So, it could be, it could be not. -I'd say we both hated that. Why we've got it there, I'm not sure. -Maybe cut our losses with the plate and go for that. -..because we didn't like it. you're going with the plate? Charles, tell them what they've thrown away with this violin. It's tired, but sometimes, that can be a charm in value. and it can really play sweet music. -Would you mind popping him back? We were hoping that might have been the hidden name, but no. this poor, ugly plate that you don't like. -Charles, please tell us how much they've won. but we always talk about small can be beautiful. This is very late Renaissance. This is tin-glazed earthenware, what we call maiolica. -That's marvellous. That's absolutely marvellous. Today, Lisa and Rhiannon, you are going home with £1,200. -all your expertise, as ever. on For What It's Worth. See you next time. Goodbye for now.